Coupons are codes that are generated in TouchPoint so that a person can register online after paying with cash or check for an event that has a fee. The registrant enters the code on the payment page at the end of the registration instead of selecting to pay with a credit card or bank account. Each coupon is connected to a specific online registration, but can be created for a Master Org, instead of for the specific pick-list org for registrations that have a Registration Type of User Selects or Computer Org by Birthdate. TouchPoint has 2 types of Coupons: normal Coupons that are created for one use; and Coupons that can be reused. Read more about these below. Coupons can also be used to give a discount or a full scholarship. If the Coupon’s amount is less than the total fee (for a discount), after applying the Coupon the registrant will be required to complete the payment using a credit card or bank account. Coupons work differently for Mission Trip type of online registrations, so, please read about how these work. If you issue a Coupon whose amount is more than the amount of a Deposit and the registrant selects Pay Deposit Only, he will need another Coupon in order to use the remainder of the original Coupon. Coupons can be used only once, so he will not be able to use it again. So, for this use case, it is better to issue 2 Coupons to begin with: one in the exact amount of the Deposit, and the other for the balance of the amount paid by check or the amount of a discount you are giving him. While you can give someone a Coupon in order to allow him to register online and have a portion of the fee paid with a Coupon, we also have a different option for giving discounts and scholarships. You can change the amount that a person owes (either up or down) by making an Adjustment on their member dialog. A user must have the user role Coupon to create basic one-use Coupons, and the user role Coupon2 to create reusable Coupons. A coupon can be canceled if it has been created in error or if the person loses the Coupon code. If someone is paying for multiple family members for the same event, he should be issued one coupon for the total amount or whatever amount is to be applied as a discount for the entire family. If someone is paying for different events, he should be issued a Coupon for each event. A coupon can also be issued for use when someone registers the wrong person for an event. Go to Organizations > Coupons from the header, and click the green Create Coupon button. Select a Registration Type from the drop down list. This is the name of the organization, with the Program and Division at the beginning. If you are using a Master Org, select that instead of an individual org. You can enter any part of the Program, Division, or Organization and a list will populate based on what you enter. This makes it much easier to find the right organization when you have a lot of online registrations. Enter the name of the person purchasing the coupon. This is just as a reference and does not have to be the same as the person who will use the coupon. Enter the amount paid or the amount of the discount or scholarship (ex. 15 or 12.50 - no dollar sign). Do note enter anything in the Coupon Code field as it will populate automatically. You can also copy the Coupon Code and paste it into an email and send it to the person. Enter nothing in the name field. Enter the amount for the Coupon. Enter the Code you want for your Coupon. It must have NO spaces and it must be 11 characters or less. Press the blue Create Coupon button. Go to the Coupon List and filter for the Coupon. Click the Cancel button beside it. After that, if someone tries to use the Coupon they will see the message “Coupon Cancelled”. This is a good way to give a discount up to a specific date. On that date, just Cancel the Coupon. You want your staff to have a certain amount off a registration for their children, so you email them a RegisterLink2 along with the reusable Coupon Code you created, letting them know how much of a discount this will give them. You can even create multiple reusable Coupons for the same event in case you need to give more of a discount when someone registers multiple children. These can be used year after year as long as the amount is still applicable and you reuse the orgs. If you want to apply the same discounted price for an entire group of individuals, read about Org Fees in the article below. The person registering for the event should go online and register. After pressing Complete Registration , if there is a page to agree to the Terms they must click Accept in order to proceed. On the payment page, the will enter the Coupon Code in the field at the bottom of the page, and press Apply Coupon . If there is an option to pay a deposit or pay the total, select which option you are using. If the Coupon amount is less than the option you choose, you will be required to pay the balance with a credit card or your bank account. If the Coupon was for the total amount of the event, this will complete the transaction. If the coupon was for less than the total amount of the event, the registrant will enter their bank info or credit card account number and complete the transaction. They will also see a message like the one below. A coupon can be created for part of the deposit. If that is done, at the time the coupon is applied, the registrant will be required to pay the balance of the Deposit during that transaction, using a credit/debit card or ACH payment. The message you will see after applying the coupon will indicate the full balance due. However, if you look at the top of the payment page, the amount will actually be the remainder of the deposit, if you chose that option. 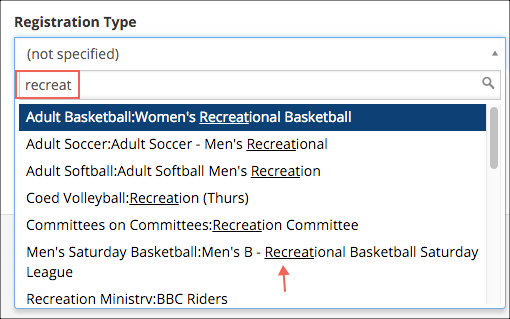 Go to Organizations > Coupon , and use the filters to find a specific Coupon or Coupons for a specific event. If a Coupon has not been used, you will see a Cancel button and you can cancel it if you need to. You can also download the list to Excel. Can Coupons be used to pay part of the Deposit for an event in order to give a discount to a registrant? YES Coupons can be used to pay part of, all of, or more than the amount of a Deposit for a registration. Remember, however, that the registrant will be required to pay the remainder of the Balance at the time they apply the Coupon if the amount of the coupon is less than the Deposit. The amount of the deposit is immediately reduced, and the registrant will see the remainder of the Balance that they must pay at that point. Also, if Extra Fees are required with the Deposit, those can be included in the Coupon or be added for payment online. Mission Trips are a very special type of registration and Coupons work differently for these than other registrations. Please read about how they will work for: making an initial payment (deposit) or making subsequent payments using a paylink. Will the original paylink work if a registrant is issued a Coupon (after they have paid a deposit) for part of their balance? For example - to give an earned credit to students for camp. YES They will always use their original paylink. Each time they use it, the correct balance will be calculated when they get to the payment page where they will apply the Coupon or make a payment.